Mimi C. Satter, Esq., a founding member of the firm, has practiced Union-side labor and plaintiff’s employment law since 1977. Ms. Satter started the current practice in 1984. Previously she worked in Washington D.C. in the Office of the General Counsel, International Brotherhood of Teamsters (1977-80); and at Blitman & King (1980-84). She has extensive experience representing unions and employees in the public and private sectors, especially in the fields of healthcare, public safety, education and transportation. Ms. Satter has represented individuals in federal and state litigation involving discrimination, sexual harassment, non-compete agreements, First Amendment claims and other employment-related matters. Additionally she has represented TV and radio personalities, among others, in a wide range of contract negotiations. Ms. Satter has been an adjunct professor at the Cornell University College of Law and Syracuse University College of Law, teaching in the area of labor and employment law. She has been a Guest Lecturer at both the Cornell School of Industrial and Labor Relations and Law School. She has presented training programs for the International Association of Fire Fighters, NYS Federation, SEIU and the GMP International Union. Ms. Satter has presented papers before the New York State Bar Association, Labor and Employment Law Section; Lawyers Coordinating Committee of the AFL-CIO; Industrial Relations Research Association; and the National Employment Lawyers Assn. In addition, Ms. Satter is a Senior Editor of Labor Union Law and Regulation, published by the ABA and BNA. Ms. Satter is admitted to practice law in local and federal courts in New York (1981) and Washington D.C. (1978), as well as multiple federal courts in Connecticut, Pennsylvania, Indiana, Ohio and Texas. She is a graduate of Oberlin College (’72) and the Catholic University of America, Columbus School of Law (’77). 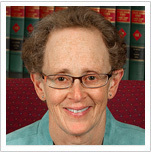 Ms. Satter has been a member of the American Bar Association, Labor and Employment Law Section; New York State Bar Association, Labor and Employment Law Section; AFL-CIO Lawyers Coordinating Committee; National Lawyers Guild; Women’s Bar Association, Central New York chapter; and the Onondaga County Bar Association. She has been recognized in Upstate New York Super Laws for her work representing unions and plaintiffs in employment matters. When not practicing law, Ms. Satter enjoys triathlons, swimming, gardening and her family.